The nation’s IT capital Bengaluru has established itself as a prime real estate destination for Grade A office space as well as residential options at competitive prices. The phenomenal growth of Bengaluru has led to the development of several micro markets and Sarjapur in the south-east corner of the city is one such prominent hub. Well-connected to key IT cluster areas like Whitefield, Electronic City and Outer Ring Road, Sarjapur is witnessing rapid development of commercial and residential projects. Sarjapur was considered to be a mid-level real estate market until a few years back. Progressively, from 1996-2002, Outer Ring Road came into existence to ease traffic throughout the city. The game changer for the area was the entry of IT giants like Wipro and Infosys and the setting up of their campuses in the late 90’s during the IT boom in Bangalore. The availability of large land parcels for both commercial and residential development has also made Sarjapur an attractive proposition. Developers of commercial property have turned to Sarjapur Road as larger spaces were not available in other IT hubs such Whitefield or ORR. This in turn has paved the way for residential development for the middle-income group. 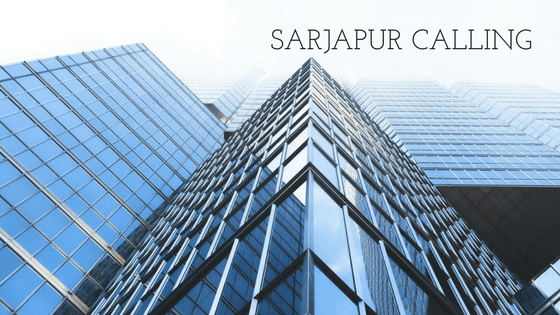 Sarjapur’s connectivity to IT hubs and its location along the Outer Ring Road (ORR) has sealed its position as a prime real estate destination. The stretch is well connected to areas such as Koramangala, Whitefield, Marathahalli, Electronics City, Silk Board, and ORR. Connectivity to Sarjapur has been further improved with the signal-free corridor initiative, cutting travel time considerably. Most of the high traffic junctions now have flyovers or underpasses and the area is well connected to NH-207 (towards Hoskote/Kolar) and NH-4 (towards Hosur), which makes commuting to offices and schools easier. According to experts there are around two lakh employees working in the Outer Ring Road stretch making Sarjapur Road a very busy IT corridor. There is consistent demand for residential real estate coming from IT sector professionals working in these areas. With markets such as Whitefield, Electronic City, Outer Ring Road becoming saturated, Sarjapur Road has emerged as the first choice among buyers. The booming residential market in Sarjapur is mostly driven by end-users. There are more than 40 apartment projects across categories of developers available in this market, with prices ranging from Rs 2500 per sq ft to Rs 7000 per sq ft. Experts peg the average price for an apartment in Sarjapur Road at around of Rs 4500 per sq ft. At the same time, the capital value of residential lots is estimated to be in the range of Rs 22,100 – 27,200 per sq yard. The largest demand is for houses priced within the Rs 50 lakh bracket mostly comes from end users. Accessibility and availability of social and physical infrastructure have added to Sarjapur’s image as a promising real estate hub. The locality is known for its greenery and is home to the famous Billapura Lake. Sarjapur is also an educational hub and houses Bangalore Technological Institute, ITM Institute of Hotel Management and Bangalore College of Engineering and Technology. The locality boasts an established network of hospitals, schools, hotels and malls making it popular among families and young IT professionals. Despite being a developing real estate market, one of the major drawbacks in Sarjapur is the lack of traffic management. Traffic congestions at major intersections and poor development of internal roads are issues that residents in this area have to deal with. With the further development of residential and commercial properties and increasing population, an efficient road network and traffic management is imperative. Going forward, the presence of existing office spaces combined with a number of under construction and proposed Grade A office spaces is expected to increase the demand for residential options in Sarjapur. The micro market is showing great potential for growth and properties here are expected to fetch good returns over the next few years. Some of the proposed projects which are expected to make an impact on the real estate sector here include the upcoming Peripheral Ring Road (PRR) project that will link Tumakuru Road and Hosur Road, intersecting at Dodaballapura Road, Ballari Road, Old Madras Road and Sarjapur Road. Moreover, the proposed Central Silk Board – Hebbal Metro Line will cover vast stretches of the ORR, linking areas such as Sarjapur Road, Marathahalli and Mahadevapura. The widening of Sarjapur Road from Outer Ring Road to Dommasandra is also expected to resolve traffic snarls and congestion.